I was speaking with a friend recently about our “first loves” and during the conversation I shared how I knew that I was in love, both the first time and later when I met my wife. After my wife and I had been dating for a while thoughts of the future and what could happen began to float around in my head. I wondered if I loved her and after pondering this for a time I came to realize that, yes, I did love her. I knew that I was in love with her because of one thing: I cared more about her happiness than my own. I was not only willing but wanted to spend my life pursuing her happiness. She was more important to me than I was to myself. This willingness and desire to be selfless is a key ingredient in a successful and happy marriage and is necessary to developing and maintaining uplifting love. Being selfless is much harder than being selfish, especially at first. Our human nature instinctually inclines us toward selfishness because often, hundreds or even thousands of years ago, being selfish could keep you alive. You could say that we are wired to be selfish. However, today our survival does not depend on being selfish. In fact, marriage and our lasting happiness depend on NOT being selfish. 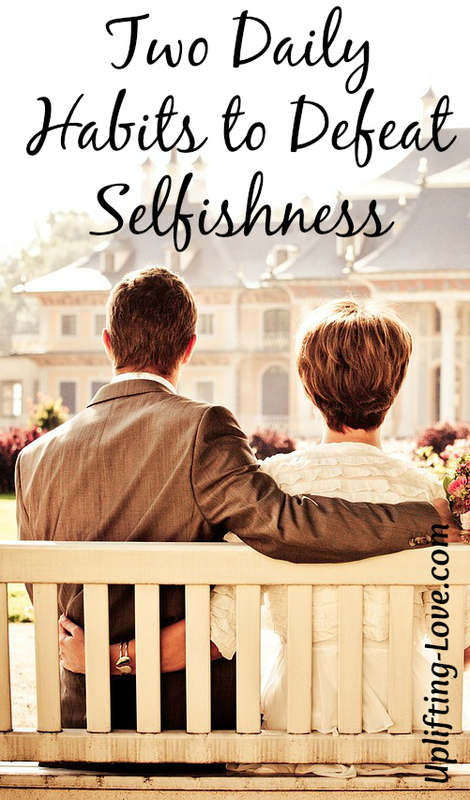 We will not go into examples of what being selfish is or is not because it varies too much from individual to individual and couple to couple. But, we do need to make a concerted effort to put our spouses before ourselves. Selflessness is not as hard as it can seem. It does require effort but establishing two habits will help each of us go a long way to “putting off” selfishness. The first is to pray for help. Pray for your spouse. Pray that their needs and wants will be met. Pray that they will be blessed and that they will receive the divine assistance that they need. Pray for them. Make a conscious effort to spend more time praying for them than for you. Second, do one thing a day that your spouse would have had to do and would normally do like take out the trash, brush the children’s teeth, walk the dog, mow the lawn, etc. The list goes on and on. Just find one thing, big or small, each day and do it. It’s that simple. Strive for selflessness. Put your spouse before yourself. Strive to care more about helping your spouse get what he/she wants than what you want. Pretty quickly you will realize that your love and appreciation for your spouse has multiplied and theirs for you has increased as well. Developing uplifting love is a process and to succeed your spouse must be more important to you than you are.